Summary: An all-expense-paid week at a luxury villa in Jamaica—it’s the invitation of a lifetime for a group of old college friends. All four women are desperate not just for a reunion, but for an escape: Tina is drowning under the demands of mothering four young children. Allie is shattered by the news that a genetic illness runs in her family. Savannah is carrying the secret of her husband’s infidelity. And, finally, there’s Pauline, who spares no expense to throw her wealthy husband an unforgettable thirty-fifth birthday celebration, hoping it will gloss over the cracks already splitting apart their new marriage. I was very excited to learn that Sarah Pekkanen has a book deal for a new novel every spring until 2015 because that means that I will be able to anticipate a new story from her for at least two more years. Sarah is one of my go-to authors, and I even consider her an "author friend." I was lucky enough to have lunch with her a few years ago at BEA, and she was as delightful in person as I had imagined! Her latest novel is titled THE BEST OF US, and the positive reviews are already coming in. THE BEST OF US has received a starred review from Publishers Weekly and People Magazine gave it 3.5 out of 4 stars. Not too shabby! With this novel, I think Ms. Pekkanen has most definitely made a name for herself as a premier writer of books with "real" female characters. THE BEST OF US is about four college friends (and their spouses) who take a week long trip together to Jamaica courtesy of one of the friend's wives. Each woman on this trip is experiencing some personal problems and hope that a week away from it all will help to fix what's gone wrong. For example, Tina is a mother of four little ones and feels that her life is no longer her own (and frankly with four kids, it isn't!) Then there's Tina's best friend Allie who is usually the glue that keeps everyone together, but she's reeling from the news that a serious illness might run in her family. Savannah is separated from her husband but doesn't want anyone to know that her husband cheated on her. Finally there's Pauline, the organizer of the trip and wife of the only male in this group of friends. Pauline is keeping some pretty serious secrets from her husband, and it's beginning to take a toll on their marriage. Jamaica seems like the perfect place to escape. The friends (and their spouses) enjoy gourmet dinners cooked by a personal chef, beautiful weather, dancing, and lots of alcohol. However, a hurricane is coming towards the island. Despite all of the fun, there is some underlying tension between the friends; and each woman is forced to examine her own life and what she needs to make her happy. 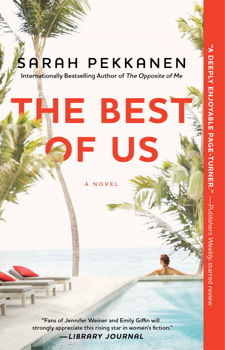 Overall, I enjoyed THE BEST OF US but, if I'm being entirely honest, it wasn't my favorite Sarah Pekkanen book. There wasn't inherently anything wrong with this novel -- the writing and the character development were all good. It was just that I wasn't able to relate to the characters like I had hoped. For much of the story, I found myself annoyed at their behavior and I even found them to be a little whiny. I guess I just felt that they brought a lot of their problems on themselves. But heck, isn't that usually the case for any of us? Having said that, I did find that I enjoyed the second half of the book much more than the first. I began to appreciate the various characters' personalities, and I definitely liked how everything was resolved. All of the characters seemed to realize the changes (or actions) they needed to take in their lives to make themselves happier and also have healthier relationships. After I finished THE BEST OF US, I found that the story was uplifting and had some valuable messages for woman. One aspect of the story that I definitely appreciated was the setting -- a villa in Jamaica. Ms. Pekkanen did a marvelous job of describing the beauty of the island, and I was extremely jealous that the characters had such a luxurious vacation. (Of course, there was that whole hurricane thing which was pretty scary.) The descriptions of the beaches and food and drinks definitely make THE BEST OF US an ideal summer read! Look at me, already thinking ahead to warmer weather! THE BEST OF US had quite a bit of drama for a novel given the characters' turmoil in their lives as well as the tensions between the characters. Plus there was a devastating hurricane that stirred things up too. I appreciated how the author juxtaposed the danger of the approaching hurricane with the stresses in each character's life. Once again, I thought Ms. Pekkanen showed an astute ability to create genuine women with realistic problems. I also like how she features the special relationships in women's lives whether it be marriage, motherhood, or friendship. THE BEST OF US would make for a fun book club pick. Just think of all the fun party drinks you could serve! There is a reading guide available with twelve questions, and some of the topics you might want to explore include trust, secrets, infidelity, marriage, motherhood, friendships, behavior patterns, and jealousy. THE BEST OF US is an entertaining read that's an ideal way to escape from the daily routines of your own life! Just skimmed this because I plan to read it over the weekend. Sarah hasn't let me down yet! Thanks for your honest review! This is the third review I read on this book and I think I will eventually read it too. You and Kathy are so funny with all the reviews you do on the same day! I can't wait to read this! I'm so excited to read this one. You know not long ago I binged on all her books and read them all in one month. And I still wanted more when I was done! Sarah is such a wonderful person and her personality really shines through in her books. And hell to the yes, I would do one of these trips to Jamaica! Even with a hurricane! Sounds like the kind of book I would enjoy. I love books that bring out different relationships between a number of characters. I'll have to give this author a try.